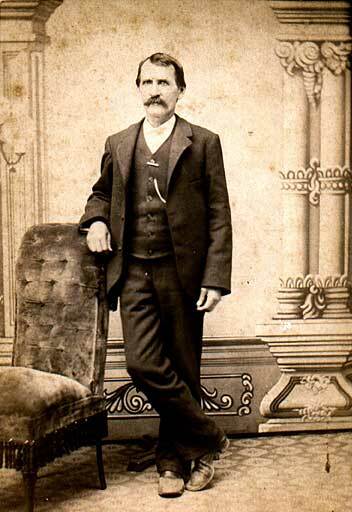 James Skidmore was born on April 12, 1830 in Hardy County, West Virginia. His parents were Andrew and Elizabeth (Stonestreet) Skidmore. James was the youngest of twelve children. James married Rebecca C. McBee (born on October 31, 1827; died on June 3, 1857 at age 29) on August 7, 1852 in Hardy County. James and his brother Samuel Skidmore patented a total of 1154 acres on the Red Creek in Randolph County, West Virginia, in 1848 and 1853. On April 4, 1856 James and Rebecca Skidmore deeded a part of this land to his father Andrew Skidmore and moved, with their three children, immediately thereafter to Middlefork Township, Vermillion County, Illinois. Rebecca died a year later and was buried in the Wallace Chapel Cemetery near Potomac in Vermillion County, Illinois. On October 9, 1859 James and second wife Martha Hornbeck were married by Reverend D .S. French at the Gospel Baptist Church in Vermilion County, Illinois. Martha died in 1861 about two years after their marriage. Thus, when James enlisted in Fifty-First Illinois on November 14, 1861, he was twice a widower. He enlisted as a private in Captain John McWilliams Company E.
In 1862 and early 1863, James had two separate bouts of illness that kept him away from the regiment—in hospital and on furlough. James was wounded by gunshot in the left arm at Chickamauga, in the brigade charge across the Lafayette Road and into the east Viniard field, on September 19, 1863. He was subsequently treated in Nashville military hospitals and returned to duty three months later. In December 1863, along with many other men of the Fifty-First, James reenlisted in regimental service—for another three years or until the war ended. In mid-1864, during the Georgia campaign, James fell ill—the diagnosis was chronic diarrhea and debility—and he again spent time in military hospitals but returned to the regiment for the campaign against John Bell Hood in October, November, and December, 1864 that eventuated in the battles of Spring Hill, Franklin, and Nashville. In April 1865, James was promoted to first lieutenant and put in command of Company F, which had become denuded of officers (George Bellows killed at Missionary Ridge, Andrew Fraser resigned, Robert Houston wounded and disabled, Calvin Thomas killed at Franklin, George Waterman wounded at Spring Hill and awaiting disability discharge.) Just at the time of Skidmore's promotion, his father died in West Virginia. James requested leave to attend to his father's estate in this May 29, 1865 letter to Brigadier General Whipple, the assistant adjutant general of the Army of the Cumberland; in the letter he refers to his brother in the Rebel army. Company F was the last company to join the regiment, joining in the field in northeast Mississippi in late July, 1862—after the New Madrid/Island No. 10 and Siege of Corinth campaigns. Since the terms of service of the men of Company F at the end of 1863 were less than two years, the men of Company F were not allowed to reenlist when the rest of the regiment did. The men of Company F were the first to complete service, as an entire company, in 1865. Thus, the Illinois adjutant general's regimental history reads, "June 15, Company F, Lieutenant James Skidmore commanding, was mustered out of service." A journal kept by a soldier of the regiment read, for June 15, "Co F moved to 1st Brigade quarters. The 51st left Nashville with the corps for New Orleans & Texas. Co F bid good bye and god speed to their old comrades of the 51st with whom they have so long shared the hardships and glories of a soldier's life." Funeral services for "Uncle Jimmy" Skidmore, who died at his residence last Wednesday morning, were held from the Baptist Church at 2 o'clock Saturday Afternoon, conducted by Rev. Helen Hill-Tanner. Burial was in the City Cemetery. "Uncle Jimmy" Skidmore was perhaps the oldest resident here, as well as a pioneer settler in the county. The family have been prominent and well-known citizens of Columbus for the past fifty years, and Mr. Skidmore leaves a wide circle of friends throughout the county. James Skidmore was the youngest of twelve children. His father, Andrew, and mother, Mary A. Skidmore, were residents of West Virginia, where they reared their family. James Skidmore was born April 12, 1830, and with his wife, Rebecca McBee Skidmore, and three children, Sarah, Andrew and Marry, removed from West Virginia to Illinois, and in 1874, he, with his [third wife Margaret] and three youngest children, Mary, Charles B. and Kittle C., moved to Cherokee County, Kansas. Soon after coming to the county he located with his family in Columbus where he resided until the final bugle sounded, May 1, 1924. He enlisted in 1862 in the Union army and served three years nine months and fifteen days. He received an honorable discharge at the close of the war as first lieutenant, although for several months prior to his discharge he was active captain of Company F, 51st Regiment, Illinois Volunteers. He was a good soldier, a brave and efficient officer and a 100 percent loyal American. He was ever ready to and never failed to render assistance to those less fortunate physically or financially. He was a consistent Christian, being for about seventy years of his life an active member of the Baptist Church. He possessed a cheerful disposition and for many of the last years of his life he was, to his delight, known as and called "Uncle Jimmy." On the day prior to his departure he was informed that he had about reached the end of his life, and he replied: "Very well. I have lived a clean life. I have kept the faith and am ready for the final call." He was conscious up to within a few hours of his death. He left a rich inheritance by the Christian fortitude he displayed through life and in the hour of death. "Uncle Jimmy" will be greatly missed not only by his immediate family, but the friends he left who are legion. He left surviving him his daughter, Sara Mayhew and family [Lawrence, Kansas], Mary Radley and family [Phoenix, Arizona] and Kittle Skidmore Cowan [California], and his sons, A. H. Skidmore and family, and C. B. Skidmore and family, and his niece Florence Moody. For the past number of years, since the death of his wife, he had lived with his niece Miss Moody. For the past few years he had been in poor health, and Miss Moody was his faithful attendant and, although teaching school, she gave him every care and attention, seemingly unmindful of her own comfort, and she has constantly looked after, doctored and nursed him, being ever faithful in sickness and in health. James Boyd, major in command of the regiment at the time, handed Skidmore a locked box containing Company F's muster-out rolls just as the detachment of 37 men left for Chicago, final pay, and discharge. When the rolls were processed in Chicago, it turned out that very little of the muster-out paperwork was signed, and Skidmore was caught in red tape and slow communication—whiling away his time in Chicago while the papers were sent back to Nashville for the muster-out officer Captain Chickering of the Eighty-Eighth Illinois to sign. The muster and discharge officer in Chicago wrote in his cover letter, "I would state that Lieut. Skidmore is here under considerable expense awaiting payment" (June 24, 1865). It was not until October that Skidmore finally received final payment. By the time the Company F paperwork was sorted out, Skidmore was married for a third time and settled again in Illinois. The picture on this page was taken soon after his return. He married Margaret J Ward (born New York, November 1840) on September 7, 1865. James patented 80 acres in section 28 of Lovejoy Township, Iroquois Country, Illinois, on June 30, 1869 and another 80 acres adjoining on March 8, 1871. In 1874, he left Illinois and moved to Cherokee County, Kansas where he was a farmer and stockman, a 32 Mason in Prudance Lodge No. 100 at Columbus, a Justice of the Peace, a dealer of farm implements, and a deacon in the Baptist church. Skidmore received a government pension in 1883, for service-related partial disability. Margaret died in 1911. James Skidmore died on May 1, 1924, at the age of 94. The cause of his death was bronchial pneumonia. He is buried in the Columbus City Cemetery in Cherokee County, Kansas, along with his wife and several of his children. Many thanks to Mike Skidmore, descendant of James Skidmore, for the photograph, family information, and service documents. James Skidmore, Compiled Service Record, Records of the Adjutant General's Office, 1780's-1917, Record Group 94, National Archives and Records Administration, Washington, D.C.